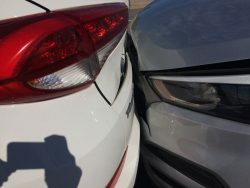 Maybe you’re out doing some Christmas shopping and don’t notice someone’s backing out of the space next to you until it’s too late. You could also be driving in the rain, forget that you’re not supposed to slam on the brakes during wet weather, and hit the car in front of you or slide off the road into a ditch. You’ve got insurance and you can file a claim. But is that a risk you’re willing to take knowing your automobile insurance rates might go up the second you pick up the phone? Carole Walker, executive director of the Rocky Mountain Insurance Information Association, told Credit Karma you are better off filing a claim if another driver was involved in the crash. If the accident was your fault, there’s a chance the other driver might decide they’re unhappy with the terms of any payment arrangement the two of you worked out and try to rehash it in court. And if the accident wasn’t your fault, there’s a chance you might mistake something that requires an expensive repair for “minor damage” and be stuck with the bill all to yourself. Walker and the writers at NerdWallet also stress the importance of filing a claim if you or anyone else involved in the wreck was injured. Medical bills can easily pile up and what seems like a minor injury at first could easily grow into something that takes weeks if not months to heal. But the two leave some wiggle room in situations where you may have backed into a pole or skidded into a ditch. Crashes like these involve a balancing act where you weigh the immediate cost of fixing your car with the long-term cost of higher premiums. NerdWallet recommends having someone inspect the car to make sure you don’t miss any serious damage and then deciding whether you should call the insurance company. If the repair estimate is less than your deductible for collision coverage – which is what you’d pay if you had to file a claim – then the answer is don’t bother. And if the estimate is higher than your deductible, then the answer really depends on how much you’re willing to pay and how you’d feel driving a car with some minor damage. Call Mennonite Insurance today at 559-638-2327 or e-mail mennonite@mennoniteinsurance.com if you have any other car insurance questions and want to know how much being covered under our plans would cost. Error: Error validating access token: Session has expired on Tuesday, 26-Mar-19 10:04:28 PDT. The current time is Friday, 19-Apr-19 02:13:59 PDT.